The Freelancer's Fashionblog: SUMMER CELEBRATIONS: THE SHANGRI-LA SUMMER SHOW JUNE 8! If you want more sparkle in your life, and even if you don't, but just want to have fun and be entertained, come watch our studio's Summer Show Friday June 8th at Sture 21! Coming to a show is always a win-win - you have a great time and help put bread on the performers' tables. Plus get your daily/weekly/monhtly dose of sparkle and (biogradable) glitter. 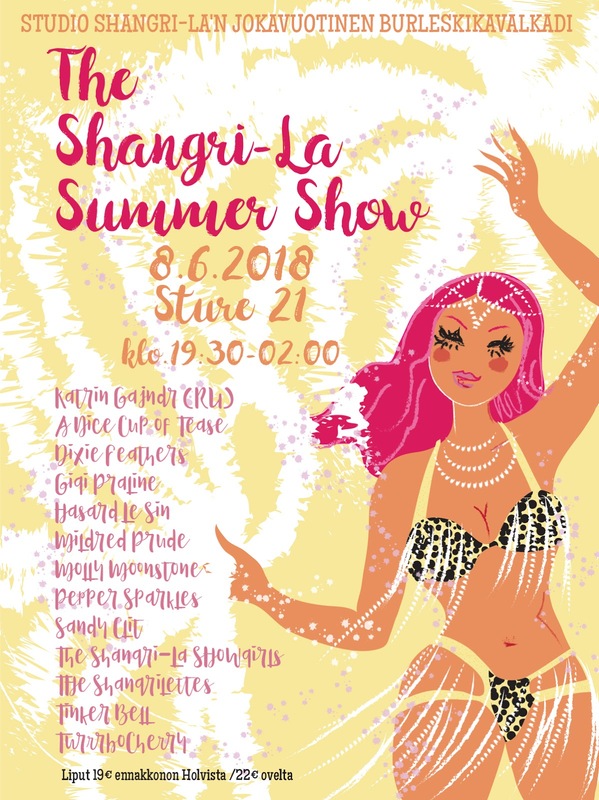 It is already the 5th summer show we organize, and as usual we feature both students and teachers as well as resident Shangri-La performers. And a lot of other fun stuff! It's a bigger show than our regular clubs, and we turn the madness down a little bit (just a little) when hosting. Find out more on the event page, and get your tickets from our webshop here: Summer Show tickets. Also, a small reminder that I have created a discount code for my blog readers to our studio which gives -15% off pretty much everything - also summer show tickets! We have several summer classes and courses coming up in June as well so have a look at our studio's webpage (still only in Finnish I am afraid, although we do teach some classes in a multilingual style Finnish-English-Swedish).